Taken as a whole, the Decade of Calipari has been a raging success for Kentucky. Ten years, a national title, four Final Fours, five 30-win seasons, five Southeastern Conference championships and six SEC tournament titles. In the history of the sport, not many college basketball coaches have put together a decade like that. This body of work was cited by many Monday in conjunction with John Calipari's agreement on a "lifetime" contract with UK. The new contract is likely a smart deal for the school and undoubtedly a smart deal for the coach, as his flimsy flirtation with UCLA quickly proved. 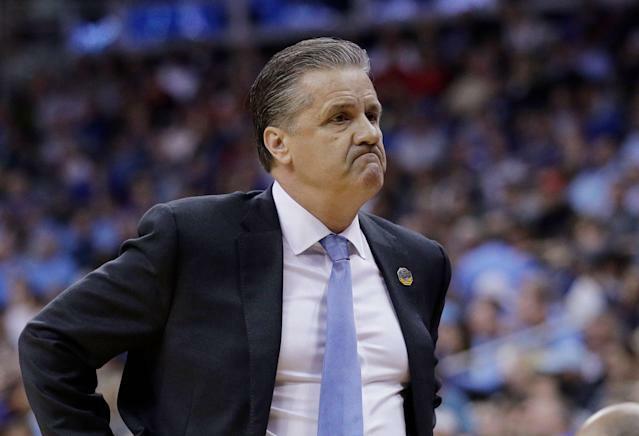 Cal flexed and Kentucky swooned. He's never going to have it as good anywhere else as he has it in the commonwealth. They're paying him $9.3 million this year. They built Wildcat Coal Lodge for his players in 2012, a modern dorm housing just 32 people right next to the $30 million Joe Craft Center practice facility that opened two years before Cal arrived. In 2017, a requested $4 million renovation to the Craft Center was approved, and at the time Calipari lobbied for renovations to the Coal Lodge as well. No expenses are spared. He wants to be the biggest deal in college basketball, and no fan base is more willing to make its basketball coach a bigger deal than Big Blue Nation. But a decade into the relationship, and on the heels of a second straight massive whiff on a Final Four opportunity, there are a few signs of strain. While most people focused on the 10-year record, it's worth noting the pretty clear demarcation of achievement between Cal's first six years in Lexington and his last four. Actually, the demarcation starts with the last game of year six, when a 38-0 Wildcats team was stunned in the Final Four by Wisconsin, which in turn lost the championship game to Duke. From that point forward, every season has ended with an underlying sense of underachievement. After four Final Fours in the first six years, there are none in the last four. In three of those four years, Kentucky was eliminated from the NCAA tournament by a lower-seeded team — No. 5 Indiana in 2016, No. 9 Kansas State last year and No. 5 Auburn this year. Both the Hoosiers and K-State were blown out in their next tournament game (we'll see about Auburn on Saturday). With a path to the Final Four wide open for the Wildcats, they were eliminated by K-State and Auburn teams that both lost a key frontcourt contributor to injury during the postseason. 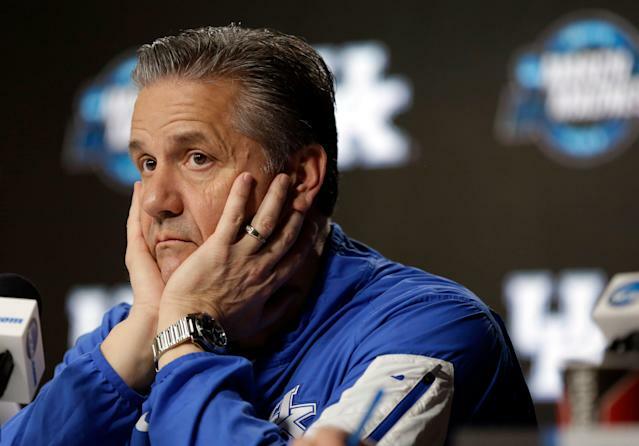 Last year Kentucky lost 11 games, a third season of double-digit defeats under Calipari. (Tubby Smith was derisively nicknamed "Ten-Loss Tubby" by Kentucky fans in the early 2000s.) Eight of those losses were in the SEC — its most league losses since the Billy Gillispie days. This year, for just the second time in the Decade of Calpari, the Wildcats won zero trophies and cut down zero nets — no SEC title, no SEC tourney title, no NCAA regional title, no national title. So there are two views of the Decade of Calipari: the big picture that portrays excellence, and the trend picture that says things are less excellent than they used to be. Or, at the very least, things are no longer living up to hypeman Cal's proclamations. "We don't just play college basketball, we ARE college basketball." "We don't move the needle, we ARE the needle." "Gold standard of college athletics." These biggest-best-greatest themes play on a loop, stoked by the annual procurement of recruiting classes that all have ranked No. 1 or No. 2 nationally, followed by the annual migration of those players to the NBA draft. And so an expectation level has been set — in no small part by the coach himself — that Kentucky will always have the very best talent and thus always should be among the very best teams in the nation. "It's the hottest program since UCLA used to win everything every single year. … As long as Calipari doesn't follow his players back to the NBA, he's sitting on a juggernaut that could redefine what's possible in the modern era." Wetzel wasn't alone in that assessment. But it hasn't worked out as projected and expected. What we learned over the next seven seasons — and especially the last four — is that winning titles and making Final Fours with teams built on a one-and-done formula is extremely difficult. Mike Krzyzewski has found out the hard way — and no way harder than this season, when the highest-rated recruiting class of all-time came up short. Calipari has found out the hard way as well. So you can give K and Cal a pass on trying to do something as difficult as winning titles with freshmen-led teams. Or you can acknowledge that this is the path they chose, while Jay Wright chose another and has done more with what the NBA says is less. You can also cite the randomness of a single-elimination tournament as a mitigating factor, as an increasing number of people seem willing to do. Or you can acknowledge that those same single-elimination tournaments have long been the measuring stick at elite programs. Early NCAA ousters did more to force Tubby Smith out at Kentucky than anything else. If Tubby was run off for losing as a No. 1 seed in 2003 and '04 and missing the Final Four for nine straight seasons, then what happens in March should be the standard for all UK coaches. Fact is, John Calipari has had a very good run at Kentucky. But his anticipated Big Blue dynasty was derailed on an April night in 2015 in Indianapolis, and it hasn't gotten back on track since. He's absolutely worth keeping as coach, but that "lifetime" contract might look different if the Wildcats continue to fall short of the Final Four the next couple of seasons.